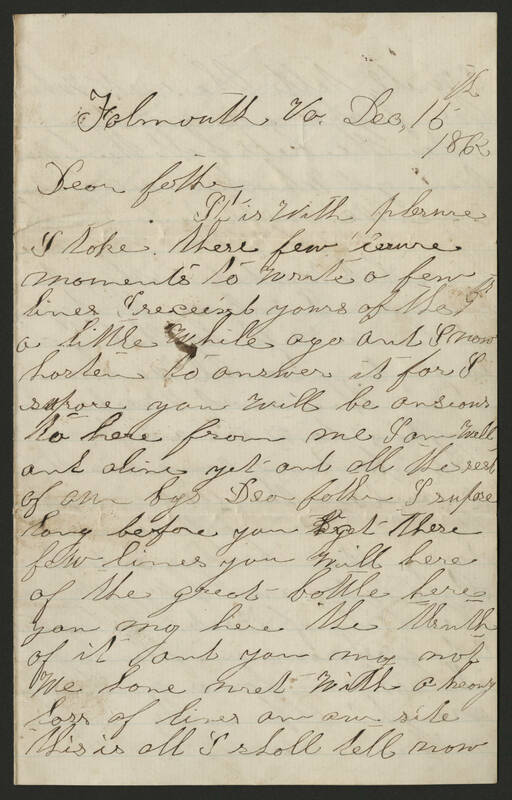 Falmouth Va. Dec, 16th 1862 Dear father, It is with plesure I take these few lesure moments to write a few lines. I received yours of 9th a little while ago and I now hasten to answer it for I suppose you will be ansious to here from me. I am well and alive yet and all the rest of our boys. Dear father I supose long before you get these few lines you will here of the great battle here. You my here the truth of it and you may not. We have met with a heavy loss of lives on our side. This is all I shall tell now.